You are here: Home / Website Building / Why Images Are Important for Website? 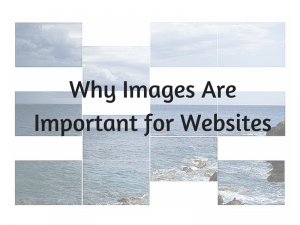 Why Images Are Important for Website? Before the birth of languages, our forefathers drew paintings on rocks and caves. Even until today, researchers could still trace those paintings to stories of prehistoric cultures and rituals in the ancient civilization. This goes to show that human beings have the innate ability to process our mental thoughts into pictures and the capability to understand the message of visuals even without words. In modern times, images are widely used as a creative tool to communicate with online readers. Why are images so important for websites and how does it impact your business? Let’s find out. The adage “A picture is worth a thousand words” could not have been more timely. These days, we are bombarded with tonnes of data on the internet. Deciphering lengthy information can be tedious, especially when we have so little time in our hands. Studies have shown that, by incorporating images, we could help readers to process their thoughts 60 000 times faster than text alone. The brain also stores visual information better than prints and because of that, we learn and remember things more effectively with visual aids. Another factor is the element of cognitive emotion. More than words, images are capable of delivering messages that can stir the human emotions and leave a lasting impact in our memories. At current, the average attention span in humans is reported to be 8 seconds. That’s not a lot of time for the brain to concentrate on a task like reading online. The constant distraction of electronics and concurrent online advertisements make it even more challenging to engage with readers as well. In order to increase engagement time, we need to make our business content more attractive by adding relevant images. The proper use of images on a web content can make online reading more interesting and drives the point home without taxing the reader’s mind. Images with the right element of colors are undeniably influential. Like visual, it helps us to recall things better than a string of words. It is also known to have profound effects on consumerism and branding power. By applying the psychology of colors (watch video), we could give a competitive edge to our website content and business outlook. Just as written content uses proper keyword research for search ranking, images can also benefit from the same strategy. By adding keywords in the title name and alt text, we are describing to search engines what an image is all about. It helps us produce higher quality content that is essential for ranking in the internet search. If you haven’t already noticed, social media loves images. With the convenience of mobile devices and faster internet speed, it’s now easier than before to upload pictures onto the internet. 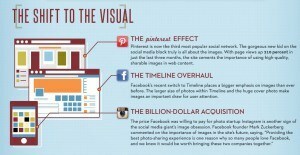 Have you engaged visually with your readers on these social networks already? As an image switches role from merely artistic to branding, it can be used as a tool to increase your website traffic to make a page sell better. Powerful images are highly persuasive. A reader who likes a certain image on a page is more likely to initiate sharing on social media and willing to respond to a call to action such as subscribing or buying a product. That’s the power of conversion. And a good one will create a lasting impression for your online business presence. So if you are running a marketing campaign and wondering where all the traffic has gone, chances are, it lacks the use of powerful images. Are you looking for ways to improve your business online? Check out my recommended training program at Wealthy Affiliate for more information. Do you have any thoughts or questions about using images on websites? Leave them in the comment area below and I’ll get back to you. Great article Cathy, that really helped me. At times I forget how important images and visuals are to website readers. Thanks for the wonderful read and a great demonstration of how much we all are effected by visual info and stimuli. I am glad my article was helpful for you, Todd. I think we are all visual people. Some people just express it more and it doesn’t mean that others lack of image sense. It’s interesting that everyone of us have peculiar taste for colors and images when creating our own websites. This is really important information for us website owners. I have a couple of sites and use images and colors always! Everything above is true for visitors but I also think what we choose for images and colors helps us show-off our unique styles and personalities. Great post…thank you. That’s the beauty of images and colors. When images are used correctly, they can capture attention and blend very well with the intention of our message. Every website owners should benefit from the power of images. I couldn’t agree more on the visual aspect, although I’m not a big fan of inforgraphics. To me, it’s just too much nonsense in a small space. They just seem too cluttered for the most part. Yeah, I get what you mean. When I first started reading infographics, I had to squint my eyes or enlarge the image in order to read the text. And then there are those that illustrate complex topics so concise, they are just amazing. Not all are superb but try to reduce cluttered information when you want to create your own infographics. Hi Cathy! A picture is worth a thousand words. Humans have very short attention span and are prone to be attracted to pictures. If you have an article that is full of words and not a single picture, most of the time, I as a reader will click on the close button, no matter how well your article is written. I struggled a lot, reading textbooks in college and wonder why the authors never add more images to perk up their description. It would have made the subject matter more interesting and most importantly for students, easier to understand the context of things. Media interaction has certainly escalated in recent years and I think online education will change the way we learn things. I did a few readings on color psychology and found it to be very subjective and contradictory to personal preference. For example, some people may find the color white as pure but others might call it boring. I think the general idea is to learn how to choose the kind of color that can affect people positively.